Alas, while there are certainly standing desks on the market today that are extraordinarily stable, many still shake like a drunken sailor on a stormy sea. As a rule of thumb, the cheaper the desk, the fewer stability-enhancing components it is likely to have built-in. Although to be fair, we’ve seen our share of very pricey desks with shameful stability characteristics, too, so price is not the only indicator of quality. In this article, we explore how each component of a standing desk plays into its overall stability. We give you valuable tips on what to look for—telltale clues of whether or not a particular desk is likely to be stable, or remain that way with normal wear-and-tear. Like all machines, the components inside the linear actuators (a.k.a. lifting columns) will wear with time, minutely increasing shakiness with each up-down cycle of the desk. This is why component quality, manufacturing precision and warranty coverage all really matter. Even if your desk performs well when first assembled, how long will it keep it up? Our expert review staff will also give you some tips on how to set up your standing desk in a way that will minimize both shaking and wear-and-tear. Induced oscillations from typing, especially if being used with an under-desk office treadmill. ANSI/BIFMA is a standards and certifications testing organization—part of the American National Standards Institute—that has defined actual testing processes to determine whether a standing desk is sufficiently stable to obtain its certification. Certification is necessary for government agencies and other large organizations to be able to purchase the product. They define the height adjustment range of a standing desk based on census data: 22″ to 47″. This is supposed to cover the range from the 95th percentile of seated women to 95% of standing men. The problem with the ANSI/BIFMA standard is that far more than 5% of the population is too tall to use a desk with this height range without experiencing significant instability, because at full extension these desks become very shaky. And that doesn’t even account for people who may be using an under-desk treadmill (adding 5″-6″ to their effective height) or an under-counter ergonomic keyboard tray (adding another 1″-3″). 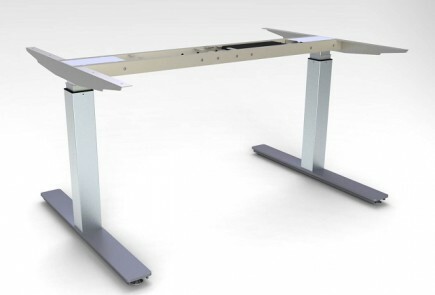 Many desk makers have already responded by increasing the length of the bottom tube of the lifting column by 2″-3″. Today, you see many standing desks, especially those made in the USA or Europe, offering desks with a 25″ – 50″ height range. While technically these fall outside the ANSI/BIFMA range for shorter, seated females, that problem is much easier to solve with an under-desk ergonomic keyboard tray and/or variable-height ergonomic chair. We would argue these desks exceed ANSI/BIFMA versus failing to meet the standard. ANSI/BIFMA really needs to update their standard, and maybe they’ll do so after the next census is published (Americans have likely grown taller on average over the past decade). Because 98% of standing desks sold these days are electric, we’re going to leave manual (crank) standing desks out of this article. Lifting columns (the desk’s “legs”) come in two flavors: single stage (two telescoping leg segments) and dual stage (three telescoping leg segments). Single stage legs typically have a stroke of about 20″ while dual-stage legs reach about 25″. You might think that adding a third segment would make the leg reach 30″, but the extra “deflection” created by adding another stage requires more of a dead zone overlap area between the three segments to keep the leg straight. While it may seem that a single-stage leg might be more stable than a dual-stage single, the total deflection is doubled. At the same height setting, a dual stage leg will have more overlapping area at the ends of the tube and thus be more rigid. So, dual-stage legs are both higher-reaching and more stable for a given height compared to single-stage. Logically they also cost a little more, typically by $100. But if you’re more than 5’8″ tall, a dual-stage is going to be your best option. For individuals over 6’1″ tall, the easy option is to use a standing desk that offers Leg Extensions as an option. These are typically 4″ – 6″ long and match the dimension and color of the bottom tube of your standing desk’s lifting columns. You’ll see companies offer these leg extensions on all their electric standing desks, for example iMovR, raising their top end heights to 55″. If you are very tall or you use an office treadmill, this is essential. But if you’d just like the most stable desk possible, adding these leg extensions increases the overlap area at the ends of each tube by a couple of inches, significantly increasing the desk’s stability. Amount of deflection. This is a function of two things: a) the precision to which the tubes are manufactured, and b) the precision to which the “glides” (gaskets that separate the tubes and reduce friction) are made, and the materials they are made of. The manufacturing of these components needs to be precise-to-the-micron. American and European-made linear actuators tend to use more exotic alloys and precise manufacturing techniques (including laser cutting of the pieces) to achieve the highest possible precision, while cost-cutting Chinese manufacturers tend to allow a lot more “slop” between these components. Too much deflection will lead to a wobbly desk from the outset, and faster wear-and-tear on the components. Too little deflection, i.e. tolerances being too tight, will lead to faster wear-and-tear on the glides, increased motor strain and increased power consumption. There is an ideal range for deflection, and it isn’t zero. The best manufacturers (again, American and European, generally) will ensure that no leg leaves the assembly line with excessively tight or loose deflection. Shape of the leg tubes. Leg tubes can be square or round—being equally rigid in both latitudinal and longitudinal directions (left-to-right, front-to-back), or they can be rectangular. Rectangular tubes are more likely to provide the best overall stability because the ratio of the long-side to short-side of the rectangle can be tuned to optimize both inherent instabilities (longitudinal and latitudinal) as opposed to treating them equally. Some people like the aesthetic of the square-tubed or round-tubed leg; of course, marketers will not say anything about their lesser relative stability to rectangular tubes in their specifications. It’s also important to ensure that the lifting power of the desk matches your application, and it’s not simply a matter of checking the weight lifting specification published by the desk’s seller. These ratings often do not tell the entire story. See our treatise on Do Weight Ratings on Electric Desks Really Matter? In the olden days, the cross bar that gave the desk its lateral (side-to-side) stability was bolted between the bottom tubes of the left and right leg (and some laggard sellers like GeekDesk still use them). There were at least three problems with this. The first problem is the reason why these bars came to be pejoratively known as “shin crushers” or “knee crushers”. The second is that they’re aesthetically ugly. And the third reason is that they do nothing to affect the stability of the desk above the first tube. Though they help a little, they didn’t help enough, and eventually most manufacturers of standing desks moved the crossbars up to the very top of the lifting columns, out of view—screwing them into the desktop as well as bolting them into the motor housings of each leg. This added even more stability by using the desktop’s rigidity to increase the strength of the platform. The best crossbars go all the way across from the left to right leg, using two sets of square tubes (one bolted to each side of the motor housing at the top of each leg). These are typically extensible so you can use the same base with a 48″ desktop as you would an 84″ desktop, but there are many variations between desk makers and within their own product lines. Some models use a non-continuous crossbar or no crossbar at all, and that may be OK for a 40″ or 48″-wide desk. Some use a non-continuous crossbar but add an independent stiffener bar that still lets you leverage the rigidity of the tabletop itself. Some use L-shapes pieces or U-shaped pieces instead of fully-squared tubes (i.e. less rigid) or skimp on the gauge of the steel. The main disadvantage of continuous crossbars is that they create a barrier to installing the sliding rail for an ergonomic keyboard tray, so some manufacturers use no crossbar or a partial one. There are numerous workarounds, however, such as using mounting the slide rail left-to-right using something like the Stowaway Keyboard Tray, using a Trackless Under-Desk Keyboard, or adding an Elevon Ergonomic Keyboard Tray to any standing desk, and retaining the maximum stability afforded by a full-length crossbar. The last element of this part of the system is whether the motor housing runs longitudinally or latitudinally relative to the crossbars. This contributes to the frame’s rigidity in one direction more than the other. Having longer and heavier feet will increase the longitudinal stability of a standing desk (front-to-back). Steel costs money and adds weight, so beware of cheaper bases that use less weight in the foot or worse, use short feet that are also too light weight. The best desks will have long, heavy feet, with internal structures that length more rigidity than just a flat piece of steel. Technically heavier feet lower the center of gravity of the desk, and the longer and stiffer they are, the less front-to-back movement you’ll get. This is particularly important if you’re a “heavy pounder” when you type, or you are typing while walking on an office treadmill. No base is used without a desktop so it’s worth discussing. Desktops are made from many different kinds of wood, each with their own flex characteristics. For a narrow 40″ or 48″ desk this will have little material effect on the overall stability of the desk. However, once you go over 60″ or 72″ (depending on the type of wood), the thicker, the better. A thin 3/4″ top may not add any stability at all. For wider desks we always recommend at least 1-1/8″ thickness or better. The same goes for desktop depth. Most are 30″ deep. Compact desks with only 24″ of depth will have an easier time of longitudinal stability, but if you go the other direction to a 36″-deep desk be sure to use a base with the longest, heaviest feet possible. A word of caution about desktops that are super-thick, like the MrBrightLite pictured above, or the Stir Kinetic Desk. Besides their inability to accommodate the most basic ergonomic accessories—a monitor arm and/or ergonomic keyboard tray—these desktops have a lot of mass. Any desktop to incorporates desk drawers like the HealthyDesk is also very problematic for stability, because there’s simply too much mass floating at the top (not to mention the added load on the motors of all that wood). So to sum it up, it’s how all these independent elements of the standing desk base design play together that ultimately determines the stability of the desk as a whole, and that’s why we rely on actual lab testing in our reviews. While it isn’t possible to tell from pictures alone how one desk will compare in stability to another at any given height, there are tell-tale clues that we’ve learned to detect even just from photos, and you can, too (e.g. if you’re considering a desk we haven’t lab-tested yet). You can look at the shape, orientation and lengths of the tubes used in the lifting columns, the length of the feet (and weight, if published), the way the motor housings connect to the crossbars, the shape and span of the crossbars, and the thickness of the tabletop to get some sense of whether a desk is likely to be solid or sloppy. If you see a “knee crusher” crossbar (a stability crutch, at best) or that a standing desk doesn’t offer desktop options wider than 60″ those are clues that the desk base is likely not very stable. We often say that the warranty term offered on a desk base or desktop is a reflection of how long a life you can expect to get out of a product. Thus the very cheapest of Chinese-made desks, e.g. the Autonomous SmartDesk, come with a one-year warranty on their bases and no warranty on their desktops, while the very best American-made desks will feature ten year warranties on their bases and at least five year warranties on their desktops. Some sellers extend the warranties they offer their customers in excess of the warranty terms they receive from their own manufacturers in China. While this allows them to position their desks as higher-quality models it is really a sort of self-insurance plan for the marketer since many people will simply not bother to go through the hassle of replacing a failing component. And a hassle it is, leaving the user without a working desk for some period of time, and requiring a lot of difficult disassembly, and re-assembly once the replacement part arrives. For example, head-to-head competitors Fully and UpLift both use the Jiecang base in their products, and both offer a 7-year warranty to be competitive with one another. Yet, Jiecang’s factory warranty to them is much shorter. If you want to avoid the hassles stick with a brand that has a genuine long-term warranty of at least ten years. You’ll typically only find this with an American-made brand like iMovR or Humanscale. We asked our veteran standing desk users and review staff for their tips on getting the the maximum stability out of your desk. The good news is if you follow these tips you’ll also be reducing the wear-and-tear on your standing desk’s base frame. Level the feet perfectly. This is so important! Most floors are uneven, which is the reason there are four foot levelers on every desk. Use a level tool and get each foot perfectly level, making sure that the entire desk is level between the left and right sides (i.e. lay the level on top of the desktop). This will reduce the amount of “side loading” strain on the lifting columns, maximizing motor life, reduce wear-and-tear on the glides, and make height changes as smooth as possible—and squeak-free. Balance the weight of items on your desktop. This also has a profound effect on side-loading stresses on the actuators. Since most people have their monitor arms mounted on the back edge of the desktop that puts a lot of weight on the back already, so get your other heavy items either closer to you or at least as close as possible, if not directly over the crossbars. Avoid having too much weight over one leg versus the other. Keep your linear actuators clean. Poorer-quality actuators will exhibit vertical grease lines on the inside tube(s) over time. This is especially common with lower-cost Chinese-made bases. It is a good idea to wipe this grease off once in a while so the actuators down accumulate dust and dirt, and to re-grease with white lithium or whatever kind of grease the manufacturer recommends. If you hear squeaking from your desk legs then do this immediately, and follow the two tips above, as well. See our comprehensive reviews such as The Best Electric Standing Desks and the Best American-made Standing Desks for relative comparison between all the makes and models. Learn more about how we conduct our lab reviews by reading Anatomy of a Review. And stay abreast of all the latest developments in office fitness by registering for our free newsletter.